Early photograph of the Brown Derby restaurant, a classic example of Los Angeles’s mimetic architecture. 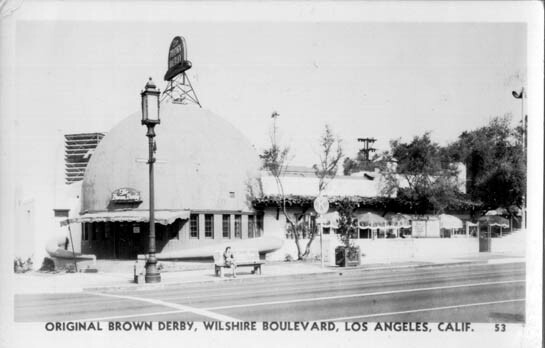 Opened in 1926 on Wilshire boulevard, the Brown Derby was a popular and well-known landmark for decades. Today, in a peculiar conflation of preservation and progress, the Brown Derby’s ‘hat’ has been saved from demolition and now sits atop The Boiling Crab seafood restaurant, surrounded by Korean businesses in a stucco mini-mall.